The Engage Cuba Coalition is launching a state council in Iowa. 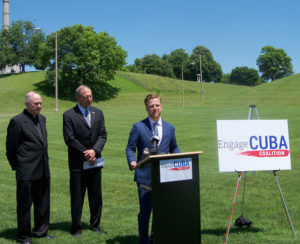 Coalition president James Williams spoke at a news conference in Des Moines where he says the goal is to lift the trade embargo with Cuba. “It’s failed, it’s failed the United States, it’s failed the people of Iowa, and it’s failed the Cuban people to live a better life themselves,” Williams says. Williams says the support is growing to fully open up trade with Cuba and that is why the group was formed. “This is a cross-section of leaders from across business, agriculture, manufacturing, biotechnology, civic duty, the faith community, academia, we are all committed to engagement. And we have an amazing opportunity to drive real benefits to Iowa’s economy,” according to Williams. He says Iowa and other states can gain from what is already happening in Cuba, as Cuba is already importing two billion dollars annually in agriculture imports on credit, but can’t buy more form the United States because they have to pay cash. He says there is a simple bill in Congress that allows American farmers and agribusinesses to sell food to Cuba. The head of the Iowa Farm Bureau, Craig Hill, spoke in support of the group. “Much of what we produce here in our fields is destined for the export world out of state and out of country. And that’s why it is ever more important for us to continue to expand our foreign market products through free-trade agreements, through the breaking down of trade barriers,” Hill says. He says the U.S. share of the billion of dollars of ag exports that Cuba takes in every year is shrinking. “If we have a better trading environment, if we establish relationships across our borders in a country that is just 90 miles away at a time when commodity prices are below our cost of production — farmers will have increased profits, increasing sales and will help feed 11 million Cubans — who by the way are seeking to improve their diets,” Hill says. The Bishop of the Des Moines Catholic Diocese, Richard Pates, was also at the news conference. Pates visited Cuba recently with the Pope and was asked about the concerns over human rights violations in the country. The announcement of the Engage Cuba Coalition launch in Iowa coincides with the visit to the state of the Cuban Agricultural minister.